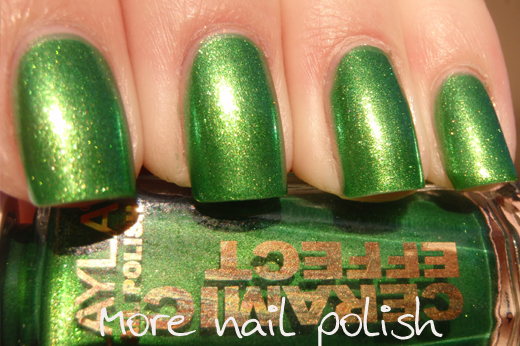 Another day, another freaking stunning polish from Layla. Here is another of the Ceramic Effect nail polishes, and this one was only just released a day or two before I placed the order. It doesn't seem to have a name, just a number - #61. It's bright green with golden micro glass fleck These pictures might be a bit warm toned, cause they were taken just as the sun was coming up - very, very early morning. If you look closely you can probably see the start of frost forming on my nails as it was -3 degrees outside as I took these. 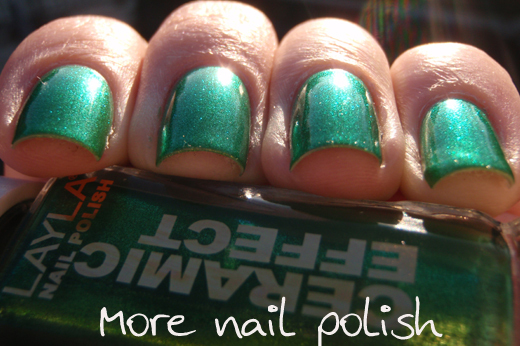 It also has an emerald green duochrome shift. Arrggghh its just so beautiful!!! And here it is in the shade. This was two coats, over Nail Tek II foundation, topped with Seche Vite. The wear on these Ceramic Effect polish from Layla is just fantastic. No tip wear, no chips, just exactly how a polish should be. I know I only just got these Layla polishes in the group order, but they have all jumped to the top of my untried pile - which embarrassingly has now filled an entire drawer of my little nail trolly. It's such a battle wanting to try new polishes, but not wanting to remove the one you currently wearing. I propose we grow new limbs so we can have multiple arms and hands with fingers to paint. Think Ganesha, but I'll pass on the elephant head. This is ridiculously amazing. Seriously, so so gorgeous! 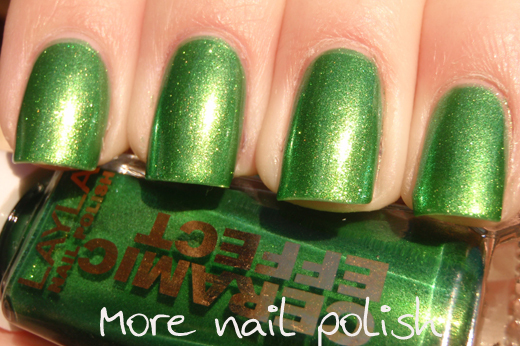 Another polish to add to the wishlist! I am so glad you streaked out to buy some of the ceramic line - I am super impressed with the couple you have shown us so far. Glad to know the wear is been good on this - not always the case on glass fleck. The growing of new arms and fingers needs to happen like now! 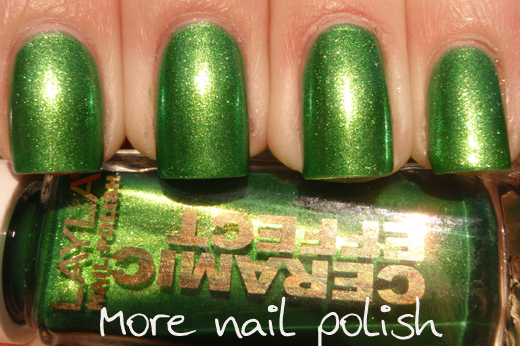 Thanks for all the great swatches - sure do enjoy your blog! It looks stunning in the shade! I love it in the shade more than the sunlight! Hah. Love your proposal. This one is gorgeous. Gorgeous! 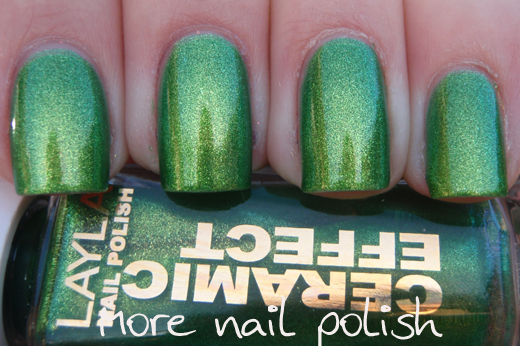 I want this green! I need more greens! This is gorgeous! I can't believe you went outside in -3 degrees. You Canberrians are tough! I like your idea of growing new limbs. That would seriously help with my untrieds pile.